Summary: Ian Gray (Michael Pitt) is a PhD student studying molecular biology with a specialty in eye evolution. Following a brief encounter with a mystery woman (Astrid Bergès-Frisbey), whose identity he uncovers through the unique colour of her iris, Ian makes a stunning scientific discovery with his lab partner (Marling) that has far-reaching scientific and philosophical implications. Some actors know how to pick their scripts, some don’t. Brit Marling is one young star that really knows how to pick her scripts. From her breakout role in Another Earth, through to her intense roles in Arbitrage, The East and The Company You Keep she has always revealed herself as an actress who knows what roles are going to make her stand-out in a good way. 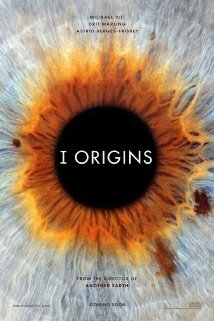 Seeing her name on a movie poster pretty much means that you’re in for a gritty drama with a bit of an alternative twist, and that is certainly the case for her new film I Origins. Here Marling plays Karen a young scientist who is teamed up with the talented Ian (Michael Pitt) a doctor whose fascination with the human eye has led him to being on the verge of a huge scientific discovery. That same fascination also draws him into a passionate yet also volatile relationship with the beautiful Sofi (Astrid Berges-Frisbey), a young model whose alternative view on the cosmos often challenges Ian’s scientific beliefs and has him wondering just how right he really is. When tragedy strikes though he soon begins to see that maybe both his and Sofi’s beliefs may be able to meet comfortably in the middle. If you’re looking for a big action blockbuster then move right along because I Origins certainly won’t be the film for you, no this a well-written slow burn drama just like director Mike Cahill’s first film, Another Earth, was. Despite the fact that his screenplay is slowly paced the film is never short of suspense. There is one moment that really takes the audience by complete storm, while the second half of the film bubbles along with a very different kind of suspense. Having said that though the last quarter of the film does feel a little rushed and it also feels like there is another storyline during that part that was left on the editing room floor. Perhaps though the best part of I Origins is the fact that Cahill never allows the film’s audience to become lost with ‘all the science.’ Yes there are some pretty high tech scientific terms bandied around by the characters from time to time, but for the most part the screenplay keeps the audience so well informed that they could never complain that they have no idea what is happening. In fact it is the storyline around the scientific breakthrough that moves the film’s suspense along even though by the end of the film you could argue that it has well and truly branched out into science fiction. And while you can take or leave the ‘theory’ that the film is suggesting it never really feels like the film becomes unbelievable or that it is preaching at you. Just like Another Earth though it is the kind of film that may leave you asking questions about what you actually believe. As you would normally expect Brit Marling is at the top of her game with I Origins but even her performance takes a backseat to the one delivered by one of Hollywood’s forgotten men, Michael Pitt, in the lead role. Pitt has always been an ‘actor to watch’ ever since his early days playing the shy-Jen-Lindley-obsessed Henry Parker on Dawson’s Creek. Since then he has put in brilliant performances on the big screen as well in films such as Bully and Funny Games yet never seems to get the big roles he deserves. Here in I Origins Pitt once again shines a little as he plays the awkward scientist, but it is enough to remind Hollywood exactly what he is capable of. Also making herself known with her performance in I Origins is Spanish actress Astrid Berges-Frisbey. Most would remember the young beauty from Pirates Of The Caribbean: On Stranger Tides but here her role isn’t solely about her looks, she has her dramatic moments and she shows that she has more than enough skills to deliver what is asked of her. In I Origins she shows that she is actress with a huge career in front of her. I Origins is certainly the kind of film that is going to make you think long and hard after you have left the cinema. The theories that it explores it well looked into by Mike Cahill’s screenplay but the film is eclipsed by his debut effort, Another Earth. I Origins is slow in patches but when it’s on key it delivers some moments of true suspense and really has the audience guessing what will happen in the latter stages. Other Subculture Entertainment Reviews of ‘I Origins′: For our full I Origins review please check The Good The Bad The Ugly Film Show Ep #96 . You can also read Dave’s I Origins review on The Book The Film The T-Shirt.